I recently add new shelf's DS4243 at stack no my netapp FAS3140, after a i add the shelf, i run the following command's on filer. The new shelf's is number 4, 5 and 7.
disk show: No disks match option -n.
Please help how to solve this problem. its been already added to filer spare disk pool , Pls check in spare disk list. Do you see disks with "disk show -v"? Are they unowned? disk show -n is for listing unowned disks. Youe disks are already owned by you filer and assigned to one of the pools. Spare pool most probably. 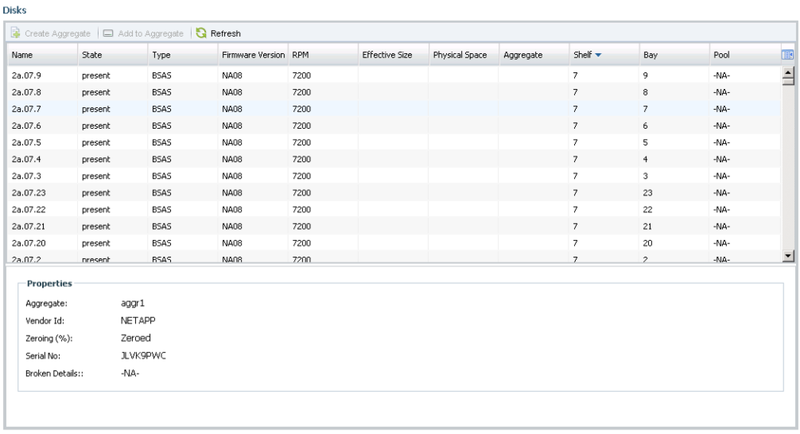 At the Netapp SystemManager, disk appear with state present. Since <disk show -n > gives output <disk show: No disks match option -n> and command < disk show -v > lists all disks with owner serial number (2015678276) , all disks have been assigned to the controller with serial number (2015678276). You must have executed disk assign -n -o <controller> after adding the new shelves. The new disks are certainly owned by your controller. But i cant create new aggregate, because i haven't disk to add aggregate because the new disk's not available. Please can clarify if the shelf's ID must be sequential??? Because my shelfs is not sequential. There is no need for shelf id's to be sequential. The shelf ID's should be unique. But it will certainly be tidy in case they are sequential but not necessary. Could you list all the steps/commands you've done after hot adding the disk shelves? Is it system I'd of your filer or partner? If not, shelf was used by other filer in the past. You will need to manually assign disks using force option. Be sure to double check!